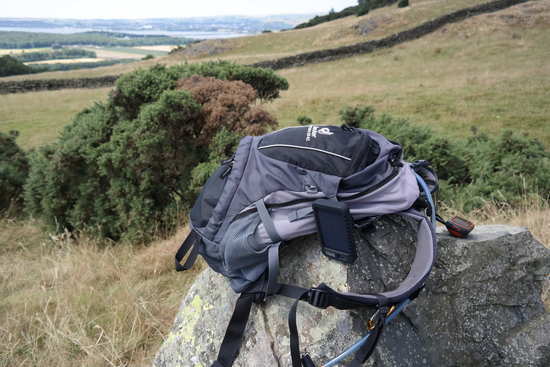 I think the green credentials are still important, but nowadays, phones and tablets and cameras and other gadgets are so much more power hungry, that if you own one, you really can’t do without some kind of power source to get you through a day, night, weekend, week of camping, etc. etc. It features two built in charging arms which are compatible with 85% of all mobile phones (micro USB and a Lighting connector for all new Apple products) whilst a standard USB socket allows virtually every other 5v device to be connected, hopefully eliminating much of the need for endless tips and cables. It also enables up to three devices to be powered simultaneously (two via the built in tips, the third via the standard USB socket). 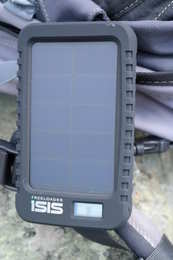 The iSIS uses a high density silicon cell to collect solar rays rather than the crystalline cells seen in older models. This means that it can collect the same amount of solar power using a 50% smaller panel. It is designed to be tough and practical, and includes a free “bomb proof” (don’t think I ought to test that claim) rubberised case to protect it from small falls. There’s also a velcro strap which attaches to this case so you can attach it to a bag, rucksack, chair, tent or whatever to charge. When it’s not in the case, there’s a fold out stand at the back which allows you to position it on a surface at a 30 degree angle (apparently for “optimum solar collection”). Take it out of the box. 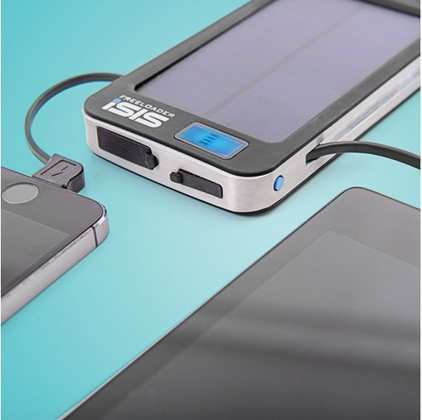 Before using, it's recommended that you charge it up fully via USB, and then you can charge it up from the sun in future. You should also charge it via USB every couple of months to ensure that it gets a proper charge. To charge when you’re not near some electricity, simply stick it in some sunshine somewhere and let nature do the rest. Very easy to use for both “charging up” and “charging devices”. For charging up, there are several ways to attach it to things so that it gets some sunshine. Without the rubberised case, you can use the little stand at the back to stick it on any flat surfaces and catch some rays. When it’s in the case, you can use the velcro strap to attach it to things. So you can attach it to the arm of your chair if you’re sitting back and relaxing on a camp site. Or you can attach it to your bag/rucksack/whatever when you’re out for the day. It’s not very heavy so it doesn’t add much weight to your load. The velcro is very strong, and you can wrap it around itself a few times. 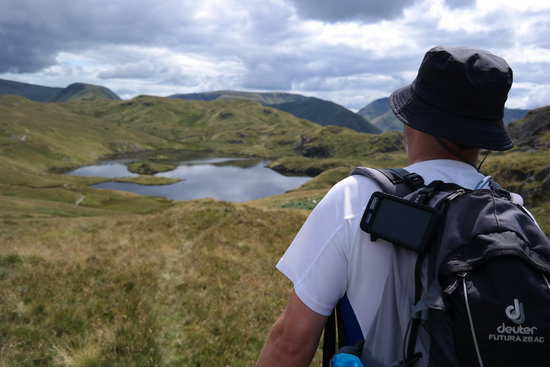 I’ve recently been out and about exploring the Lake District with it, around the Cartmel fells and then up to Angletarn Pikes above Brothers Water. It stayed in place all day long, charging up as I went. With the built in Lightning connector you can charge up an iPhone 5, iPod Touch (5th gen and above), iPod Nano (7th gen and above) and iPad (4th gen and above) and iPad mini. There’s also a built-in Micro-USB connector to charge up just about any Android phone, and a vast number of other devices. And if neither of those is suitable (e.g. if you own an iPhone 4) you can simply plug your own cable into the USB socket on the bottom, and away you go. So far it has charged up an iPhone 4, a Motorola Moto G, an iPad and a Samsung camera without any issues. With phones, you can get several charges out of a full iSIS (depending on the level of charge in your phone) and you can also charge several devices at the same time. As I mentioned in the introduction, modern mobile phones have become so much more power hungry. If you search for “iPhone battery life” or “Android battery life” you’ll get over 150 million search results. They just don’t last long enough. So if you’re not always near a power source (particularly if you’re an outdoor type who does a lot of walking, and who goes camping at sites without electric hook up) you really need some portable power sources. There are quite a few options out there, but the Freeloader iSIS is definitely at the top of the tree. The 4000mAh battery is one of the biggest out there, better than most of the Pebble range (bar the XT and Explorer). And the biggest advantage is that it doesn’t need to be plugged in to recharge, you can use the sun. Again, this is a big win for outdoor types. Once it is charged then you can just tuck it in a bag and take it out when you need to charge up. It’s not just for outdoor types, you can use it on the train (so many trains still without any or enough power sockets) or when you’ve run your phone down tweeting during a work conference. And all without increasing your carbon footprint. 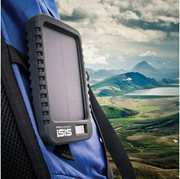 An awesome gadget which will become a constant travelling companion. Before connecting your iSIS to an Apple device, please ensure the charging port of the Apple device is clear from fluff and dust. This can be done using a cocktail stick, plastic pocket clip of a Biro or any thin non-metallic rod – give the port a good blow afterwards. The Apple device is now ready to be charged. It has been reported that the device can sometimes bring up a message saying that the accessory is not supported, and this is the solution.